I have some reservations about the use of the word 'illustrations' when it is applied to early Indian paintings, as is almost routinely done thus, "This folio illustrates an episode in the Bhagavata Purana …", for instance; or, "In this illustrated Ramayana…", etc. Reservation, because this usage clearly privileges the written word over the image, treating the painter's role essentially as subordinate or secondary. The fact often, however, is that the painter takes the text only as a starting point and then proceeds to create a visual parallel to it in his own manner. However, one cannot eliminate the use of the term 'illustrated manuscripts' altogether: not only because one has grown accustomed to such a description over the years, but also because a great many of those that have survived are precisely that. In these manuscripts too, however, the relationship of the text to the image always remains a matter of interest. One knows that a whole range of people was involved in the production of a book: there was the author of the text first who might have lived hundreds of years before a written text of his work appeared; then there were the scribe and the painter, the illuminator, the margin-maker, the bookbinder, and so on. This being the context in which "illustrated manuscripts" were often put together, questions keep surfacing thus: was the text necessarily scripted first, and the 'illustrations' brought in later? Could the order have been reversed? Are there manuscripts in which the scribe and the painter/illustrator were the same person? Are there works in which the text and the image were separated by a time gap: a 15th century text, for example, with spaces left blank for illustrations which were put in a century or two later? Puzzles such as these keep stoking the fires of controversy and disagreement among scholars. Perhaps I am saying all this because I came upon, recently, an article on the role of illustrations in medieval Arabic manuscripts, with the intriguing title: "Beauty Can Be Dangerous to Your Health". The author, Gorge Saliba, speaks essentially of manuscripts in which illustrations, though beautiful, could be inaccurate, at times even misleading. Or, worse, harmful, for a number of manuscripts contained treatises on anatomy or medicine, illustrations to which needed to be, but were not always, accurate or precise. From the Islamic world one knows of celebrated classics, copies of which kept on being produced century after century. Al-Qazwini's Ajaib al-Makhluqat ("The Wonders of Creation") was thus a perennial favourite. Texts like al-Sufi's Kawakib al-Sabitah ("A Treatise on Fixed Stars"), or al-Hariri's Maqamat , which dealt with a host of subjects, including grammar and music, were equally popular. While penning these, the scribes could, of course, make errors. But far more were the errors made by illustrators, who had no clear or accurate models to base their works upon. The illustrations, in such cases, were approximate, not precise: more decorative than meaningful. Professor Saliba cites the case of a celebrated 13th century manuscript on astronomy by al-Urdi, in which the movement of the sun was accurately rendered by the 'illustrator', but the movements of the other planets were all askew. No wonder, he says, that some alert reader of the manuscript had written, in the margin of the page, "This is wrong"! 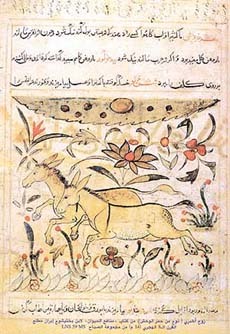 Ibn Bakhtishu's classic, Manafi al-Haywan ("The Uses of Animals") again was copied and illustrated several times, but of interest is the fact that visual renderings of the same animal in two different manuscripts tended to be entirely different, the illustrators interpreting the verbal description in the text in their own fashion. From this, Saliba moves on to medical treatises in which illustrations of herbs or plants with established medicinal value, if inaccurate, could spell disaster. There was nothing more popular, in the Arabic world, than Dioscrides' Materia Medica. But when it came to illustrated manuscripts of this authoritative reference work, there could be nothing more 'dangerous to your health', he says, than misleading visual representations of the herbs or seeds it referred to. Illustrated manuscripts with inaccurate renderings were not to be found in the Arabic world alone. there are early European works with bizarre visual renderings too. But, to go back to Dioscrides's work itself: an early printed edition of it shows the physician seated with an assistant holding up for his examination a mandrake root dug up by his dog "which died in the process", for the herb was far too potent as "an awakener of desire". The dog of course is seen lying dead close to Dioscrides' feet, but the herb itself, as held up, has a curious root shaped like a human being, very male, with a leaf, looking much like a fig-leaf, growing from it. Here fantasy, and mixed metaphors, seem to have taken over.